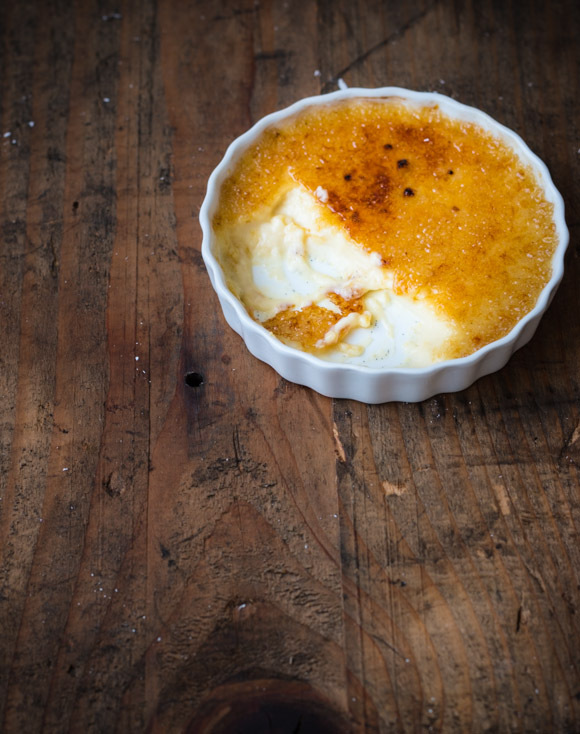 Creme Brulee (The Ultimate Guide) - Pretty. Simple. Sweet. With its creamy vanilla custard and crunchy caramelized top, here’s a full guide on how to make the perfect classic creme brulee. 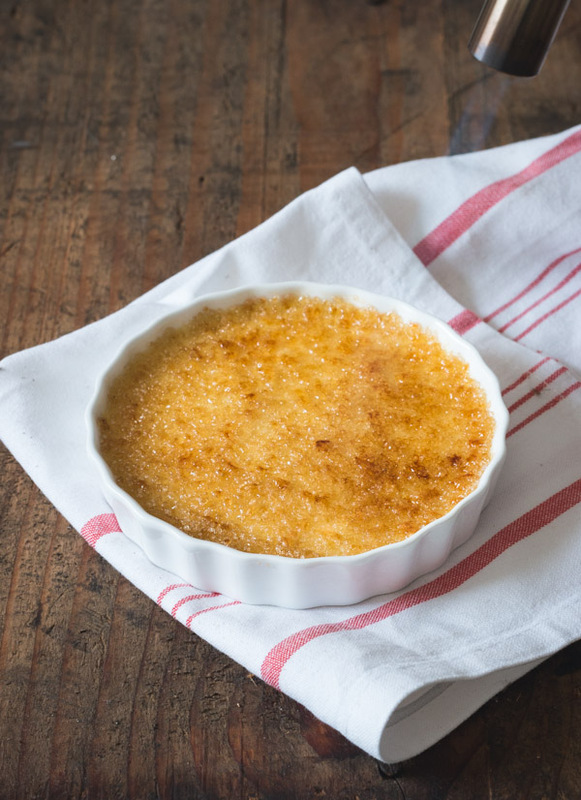 Creme brulee is much easier than most people realize. Erez was next to me in the kitchen the whole time I was making it, and later kept saying to the guests how easy peasy it was (of course it is when you just watch someone else do it 😉 ). As long as you know what you’re doing and what can go wrong, and follow some exact rules (it is science, after all), you can easily prepare it yourself in just 15 minutes. So… who’s ready to try? Cream: Some recipes use both cream and milk, which make the dessert lighter. For the richest flavor, though, I suggest using cream only. If you still want to replace some of the cream with milk, substitute up to 2/3 cup of the cream with milk at a 1:1 ratio. Heat them together in the saucepan during the first step. Eggs: Some recipes use either whole eggs, egg yolks, or a combination of them. Usually, one whole egg replaces 2 egg yolks, but as with the cream, the more egg yolks you use in custard, the creamier and richer the dessert ends up. It’s not just about flavor, but also texture. The number of egg yolks for this recipe can be either 4, 5, or 6 without changing anything else. I like using 4 for a less eggy taste, but it will be richer if you choose to use more. All options are great and depend solely on personal taste. Sugar: Usually, not much sugar is added to the custard. 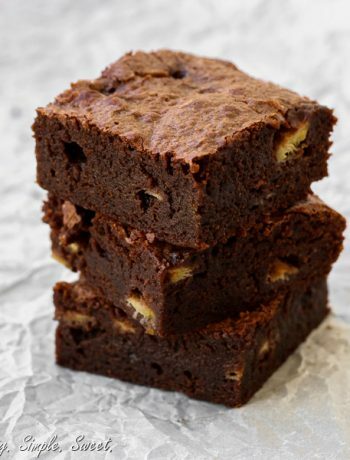 For the recipe below, you could use anywhere from 2 tablespoons of sugar to 1/3 cup, depending on taste. I suggest starting with 1/4 cup the first time. Vanilla: For a classic creme brulee, using vanilla bean is best. However, using vanilla paste or extract is perfectly fine as well! * You may also add some alcohol if you like – about 2 teaspoons of either rum, brandy, or a flavored liqueur of your choice. Add it to the mixture after all other ingredients have been combined. I’ve tried using both classic ramekins and traditional shallow dishes. I liked the shallow ones better; the ratio of caramel topping to thin custard seems to be best. Still, 4, 5, or 6 ounce (4 ounces equals 1/2 cup/120ml) classic ramekins can also be used. The shallow dishes are about 1 inch high and 4 inch in diameter. Each one will yield 4-6 servings depending on the size of the dish and how much you fill it – you can play a bit with that as well. Heat cream and vanilla in a saucepan until the mixture begins to boil. Meanwhile, whisk eggs and sugar in a bowl just until well blended but not airy. Pour the hot cream slowly into the egg mixture while whisking constantly. This technique is called tempering – since the hot cream is mixed with the colder eggs and sugar, it will prevent the eggs from curdling. Once done, the mixture should be smooth and creamy. Be sure to strain the mixture to retrieve and discard any cooked egg pieces. A waterbath simply means placing the ramekins inside a large pan and filling the pan with boiling water until it reaches halfway up the sides of the ramekins. The easiest way to do this is by first placing the large pan with the ramekins in the oven, then pouring the hot water into it. This is also the safest way 😉 Be quick about it, though, so that the oven temperature doesn’t drop due to the open door. 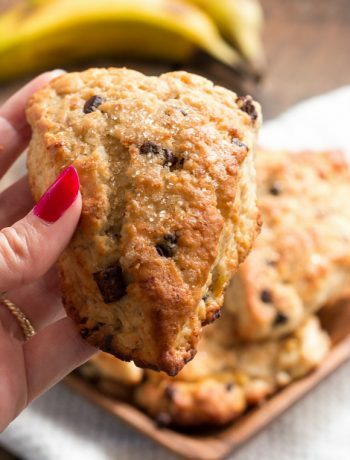 This method is often used to help delicate desserts retain moisture and reach an even temperature while baking. In addition, it’s best to place a regular kitchen towel in the bottom of the pan so that the ramekins don’t touch the hot pan directly. 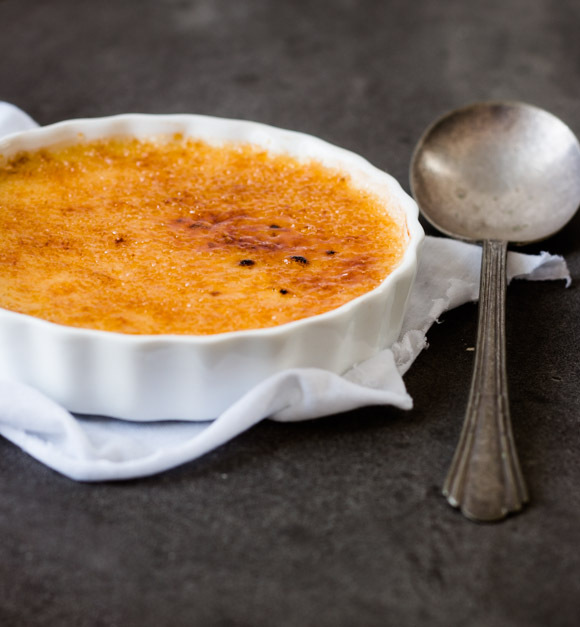 Creme brulee is baked at a low temperature. It’s done once the custard has set and, if you gently shake the dish, it only has a slight wobble.Once ready, take the ramekins gently out of the pan and place them on a wire rack to cool to room temperature. Afterwards, chill for a few good hours in the refrigerator. No shortcuts on this one! I served mine after 4 hours of chilling, which is usually the minimum time, and although it was delicious, I felt like it wasn’t completely set. Preferably, let it chill for a longer time (and up to 2 days). You’ll need a torch for this one. I like to use coarse sugar, such as demerara, for the topping, but granulated sugar is fine, too. Add sugar on top of the custard. Depending on the dish you use, it should be about 1-2 teaspoons. Shake the ramekins gently from side to side until the custard is evenly coated. Using a torch, move around to caramelize all the top. It’s ok if the browning isn’t quite even. With its creamy vanilla custard and crunchy caramelized top, here’s a full guide on how to make the perfect classic crème brulee. Preheat oven to 300F/150C. Place a kitchen towel on the bottom of a large roasting pan or baking dish (to prepare the waterbath). Place 4 6-ounce ramekins, 6 4-ounce ramekins, or 4 shallow fluted dishes on top of the towel. In a saucepan, heat cream, vanilla pod and seeds on medium heat just to a boil. Meanwhile, whisk together eggs and sugar in a medium heatproof bowl until well blended, but not airy. Remove vanilla bean from the hot cream mixture, then pour the mixture slowly and gradually into the egg mixture while simultaneously whisking the egg mixture constantly to prevent curdling. Strain the mixture, then pour evenly among the dishes. Place roasting pan in the oven and pour in boiling water until it reaches halfway up the ramekins. Bake for 25-35 minutes until the custard has set and is just slightly wobbly when gently shaked. Let ramekins cool on a wire rack to room temperature, then chill in the refrigerator for at least 4 hours, preferably longer, and up to 2 days. To serve, sprinkle 1-2 teaspoons of sugar on each dish. Shake the ramekins gently from side to side until evenly coated. Using a torch, start caramelizing the top until nicely browned and bubbly. Preferably, let sit for a few minutes in the refrigerator, uncovered, to let the top harden and the custard get cold again; otherwise serve immediately. I bought a torch years ago and it just sits somewhere in my cabinet…shame on me. 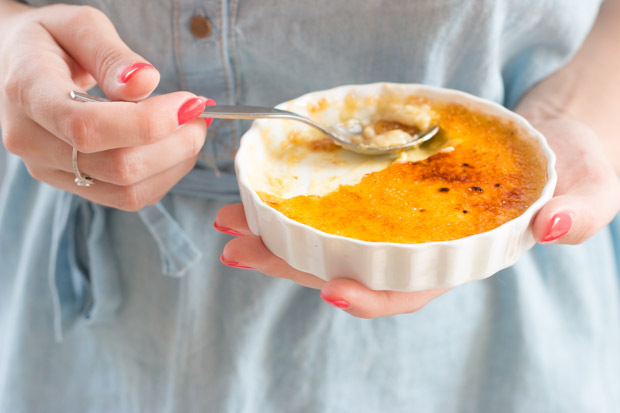 Your creme brulee looks amazing! So it’s time you make them! It’s really not that hard 🙂 And thank you! Hi, Do you have to put a towel in the baking dish? Hi Barbara 🙂 You don’t have to put a towel, but I like to do it so that the ramekins don’t touch the hot pan directly. Hi, so I just made creme brulee and it turned out to rich and eggy. I used 8 egg yolks and 1/3 cup sugar. Would you suggest less egg? Hi Tinly, how much heavy cream do you use in your recipe? If it’s 2 cups like in my recipe, then 8 egg yolks is a lot, and the result will turn out too eggy. Read my post above, I talk about all the ingredients, including the number of egg yolks I recommend to use. I used 1 cup of cream and 1 cup of milk. I followed your instructions exactly and they taste heavenly. My husband asked if I can make the creme brulee slightly more firm. How can I make it more firm by adjusting the ingredients? Hi Jackie! I’m so glad you like the recipe 🙂 Since creme brulee is a custard, it’s not very firm. It shouldn’t be too liquid though. You might need to bake it for longer next time. If you still want to make it more firm, either reduce the amount of heavy cream or increase the amount of egg yolks. Hi Shiran!! That brulee just looks sensational!! How do you caramelise the top without using a torch?? Do you have any methods to suggest?? Hi Angela 🙂 The one method I’d suggest if you don’t have a torch is the broiler. First, make sure the custard is completely cold. Place it in the fridge for a few hours. Heat the broiler so that it’s super hot and place a rack underneath it. Sprinkle custard with the sugar and place on the rack until caramelized. With this method you’ll get less caramelization than with the torch, but it works. Thanks a bunch, Shiran!! ? ?? Hi Tracey, just whip the eggs and sugar until they’re blended well and the mixture is smooth, it should be enough. I can’t say which restaurant but we would whip until it turned pale. The art is in the tempering without creating too many bubbles. 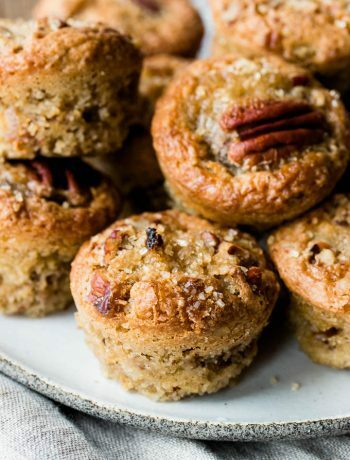 I loved making these I just needed a home recipe with home ovens and not large batch recipe. Can’t wait to try it! Just made these over the weekend. They turned out delicious, However, as you pointed out in an earlier response I probably should bake a little longer since the custard was a little runny after I had caramelized the sugar using a torch. We’ve eaten three and I’m going to try the other three this evening, This time I’ve put the ramekins back in the fridge to chill after the caramelization step. Let’s see if this helps with the “runny” custard at all, Great site by the way. Thank you Steve! It should be soft but not runny. Try to cook it more next time, or give it enough time to chill, at least a few hours. Hi Shiran! Your fame has reached Greece as well! Just found your website and I am impressed! I would like to bake this in a large pan for many people, let’s say 15. Could you please recommend how to adjust the ingredients and what size of pan should I use along with baking time? Thank you very much! Hi Kyriacos! That’s sweet of you, thank you so much! 🙂 While you can make creme brulee in one large dish, I haven’t tried it myself. It’s a delicate dessert and heat sensitive, so, unfortunately, without testing it, I don’t know the exact baking temperature, baking time, or quantities. Hi Bella, personally I don’t recommend using milk because the higher fat content of heavy cream makes it rich, stable and less likely to curdle. If you must, substitute up to 2/3 cup of the cream with milk at a 1:1 ratio. 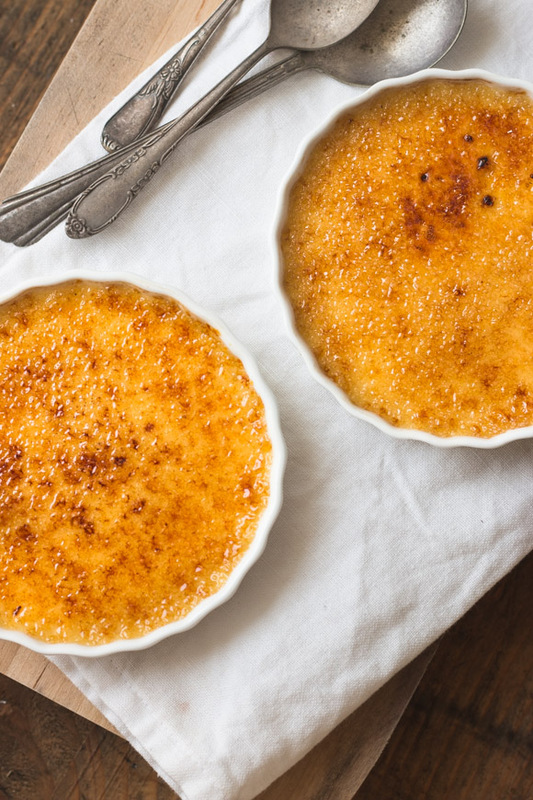 Classic creme brulee is baked. If you don’t have an oven at all, you can cook the mixture like a custard. It will taste good, but the final result and texture won’t be the same. hi, you can steam it for 15 min . just cover the top of the ramekins with foil so that the water droplets wont go in. Ok, tnx. Next question: does this travel well? I’m doing a 3 hour drive and want to take one with me to family. If i pack it in a box on, say, bubble wrap…? some other idea? or will it completely come apart by the end of 3 hours on the road? You can keep it in a cool place in the car and it will be ok, but you’ll need to refrigerate it when you get there until it’s set. Then caramelize the top before serving. I made the crème Brulee over the weekend and I thought it was pretty good, the only thing I noticed was an aftertaste of the heavy cream. I’m not sure how to get around that. The time has come. My friend bought me a cook’s blowtorch, so I can finally, FINALLY make this.